Lucifer Furnaces, manufacturer of heat treating furnaces and industrial ovens, delivered a Red Devil Series furnace to Precision Solutions, Richmond, Utah. Model RD8-KHE24 is a Space Saving dual chamber unit with working dimensions of 12”H x 14”W x 24”L in both upper and lower chambers. 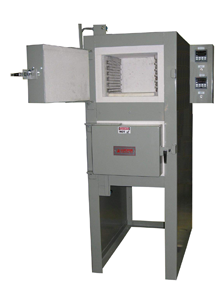 The upper hardening chamber reaches 2200°F while the lower tempering oven heats to 1200°F. Both chambers are lined with a multilayered 4.5″ combination of lightweight firebrick hotface insulation and mineral wool backup insulation for energy efficient operation. The firebrick is precision dry fit inside the chamber with staggered seams for reduced heat loss while allowing for thermal expansion. All refractory can be easily replaced through the front opening of the chamber. Both chambers contain heating elements composed of coiled heavy gauge wire of low watt density mounted in easy-to-replace side wall panels. The lower chamber has a rear mounted fan for uniform circulation of heat. Hearth plates in both chambers support the work load and protect floor brick. Chambers are controlled separately by Honeywell digital time proportioning controllers; an optional over temperature safety system is installed on the upper chamber. Precision Solutions is a machine shop specializing in custom tooling. Manager Bob Jones chose a Lucifer Furnace to bring his heat treating in-house to save time when heating a variety of tool steels.